Well, there is no confusion. This is aimed at project managers, business analysts, project leads and project sponsors. Also, you would tremendously enjoy this program if you want to learn project management. We have divided this program in 3+1 modules. Each of which spans 6-8 hours of learning time. 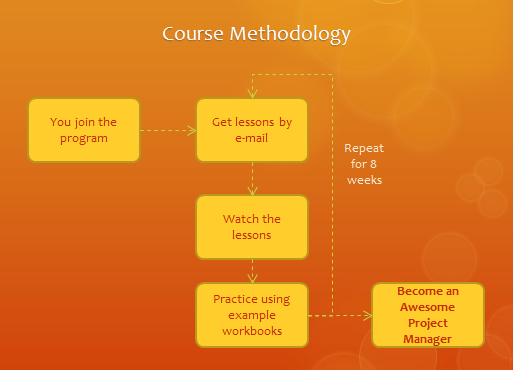 The course methodology is very straightforward. See this illustration to understand how it works. We are offering this course in 2 flavors. We are opening this program on November 14th for your consideration. There is no closing date for this. So you can join whenever you are ready to become an awesome project manager. If you have any questions or doubts, drop a comment here or email me at chandoo.d @ gmail.com. I will be very glad to help you out. PS: If you are new to Excel, consider enrolling in our Excel School program before joining this. That way, you would be better prepared for this. Love your work! With download option do the videos expire after 8 weeks from purchase? Can they be played multiple times to enhance learning or are they single use? Lastly, do workbooks come with video download option. @Bailey... The downloaded files (videos or workbooks) do not expire. You can view them any number of times. And yes, with both options, you get to have the workbooks. Hi Chandoo, I am interested in your PM class and I already took several of your classes in Excel and VB. My question is :"Don't you have some special price (discount)for the people that have taked some classes with you before ?". @Alvaro... Thank you so much for your interest in this. Ofcourse we have discount for previous students opting for this. I will email discount code details to you and others via newsletter during next few days. first, let me start by thanking you for your help and advice - surely one of the top newsletters I get in my e-mail. Thank You! 2. I can only afford the "View Only Option" - how long will the online lessons be available? If i enroll with the view only option and later decide I need to review, can I switch to the downloadable version after I have started the course? 1. You can sign up for this program starting today. I will post a link to the signup page in today's newsletter. 2. You can access the online lessons for 12 months from the date you join. 3. We will be using Excel 2007 and 2010 for this course. However, many formulas, examples and ideas can be applied to Excel 2003 as well. @Billphil: Yes, you can upgrade later. The upgrade will cost $57. As a member of PMI (Project Management Institute) I am required to earn PDU's (Professional Development Units). Do you know if this course would be accepted by PMI, or how many PDU's it would be worth? @all... this course is open now. Please visit http://chandoo.org/wp/training-programs/excel-for-project-managers/ to join us. This is very informative and easy to understand. Modules are defined very well. Yes, i agree with you can view this file them any number of times.